Rhoda Penmark (Patty McCormack) is the perfect eight-year-old child. She’s neat, tidy, overly respectful, and practices her piano dutifully. The fact that she lost a penmanship award to a fellow student doesn’t still well with her. So, when that student tragically drowns during a school picnic, people start wondering about her involvement. Rhoda’s mother, Christine (Nancy Kelly) begins to question Rhoda’s motives for everything, and soon enough unravels a hidden family lineage that sheds light on Rhoda’s behavior. More deaths are uncovered and Christine is faced with a horrible decision regarding her evil little offspring. 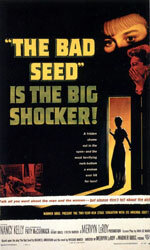 The Bad Seed is primarily a noir film, but with with horrific overtones. Since the story was originally a stage play, it can get quite talky in spots, and the main action is centered on a single living room. This allows every incident of violence (save one) to be played off camera. This is a great decision as it allows not only the imagination to take over, but it drives home how manipulative Rhoda can be, her crimes unseen. The resolution to the story must be seen to be believed. Without giving away too much, I can only assume that god (or the deity of your choice) steps in to correct the situation. An eight-year-old serial killer is pretty heavy stuff, especially for a major studio in the 1950s, but the production mitigates the seriousness of the subject through some playfully evil music and an incredible post credit sequence where the actress playing Rhoda is soundly spanked for all her wrongdoings.